Shantae, the Half Genie Hero as a Mystery Mushroom Costume! The main mod goes over Blathers, and the 8-Bit version goes over Mabel (both from Animal Crossing)! This is the first mod I've ever made, so any criticism helps! Also, the sound effects are not changed, but I may add them in an update if/when I find out how to get them. Is there any screenshots of this BTW? Yes, there is. I didn't initially post them since I didn't have time, and since forgot. I'll put them up now. This actually looks quite nice, honestly. I never seen her before, but she looks like a character from nights. My second released Super Mario Maker mod! Our Boy, the Fire Emblem warrior, Roy has joined Super Mario Maker as an Amiibo costume! Going over Lucina, he has fitting sound effects and is next to the other Fire Emblem characters! Special thanks to Kirby-Kid on Deviantart (https://kirby-kid.deviantart.com/) for making the sprites, as well as one or two more I plan on making in the future! Oh, nice! Costumes can be tedious to make since there are so many files to convert, but you managed to pull it off! Thanks! It can take a while to make these costumes, but since I'm using someone else's sprites it doesn't take nearly as long as it would. NightYoshi asked me if I could teach them how to make Mystery Mushroom costumes, so I figured that I could make a tutorial on the forum so that other people can also know. Just so you know, this tutorial will only cover replacing the sprites, not sounds. First, you must either create or find sprites. These will, obviously, be the sprite you'll import into the game. Next, you have to decide what character you're going to replace. 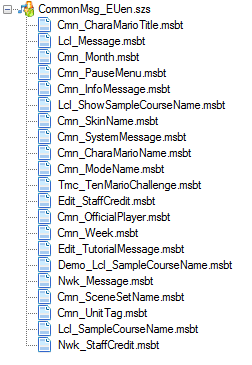 Most of the files for the costumes can be found in content/Model, but any added in updates are in content/BossNfp. It can be hard to tell who is who, since all the characters have their Japanese names internally (such as Blathers being called Futa), but just opening their file and checking the sprites will tell you which character you're looking at. Once you've decided on the character, open the .szs (from Model folder) or .pack (from BossNfp folder) in Wexos's Toolbox. Click on the drop down menu that appears, and open Output.bfres. 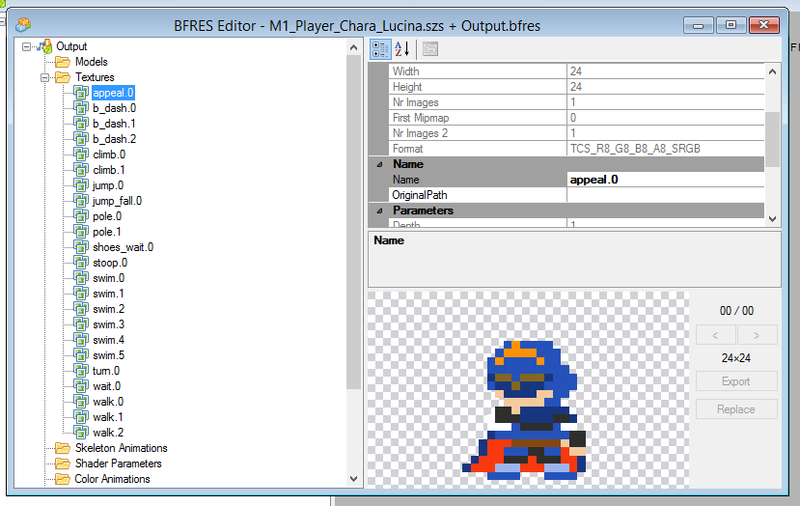 Now, you need to set to work importing the custom sprites. You can do this in many ways, but I do it by opening the image in Paint.NET, and overlaying the new sprite over the old one on a new layer. I match up the sprites as best I can, and then delete the layer with the old sprite, leaving just the new sprite. Do this for every sprite, and you'll be ready for the next step. Now that you've put all the sprites on their own images, you need to replace the files inside Output.bfres with your ones. 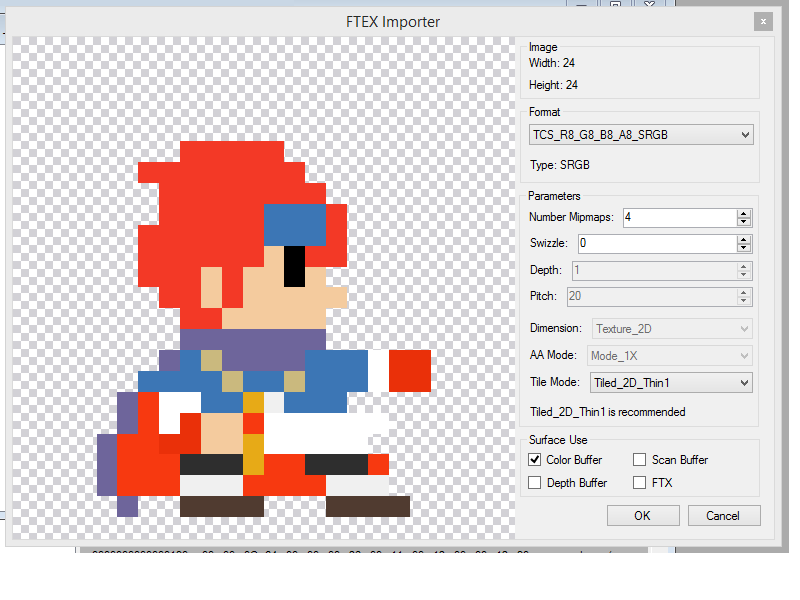 To do this, right click on the file, choose 'Replace', choose PNG files and find your replacement for that sprite. Double click on it, and choose 'Okay' on the window that opens. Once you do this for every sprite, click 'File', then 'Save As'. Name the file 'Output.bfres'. 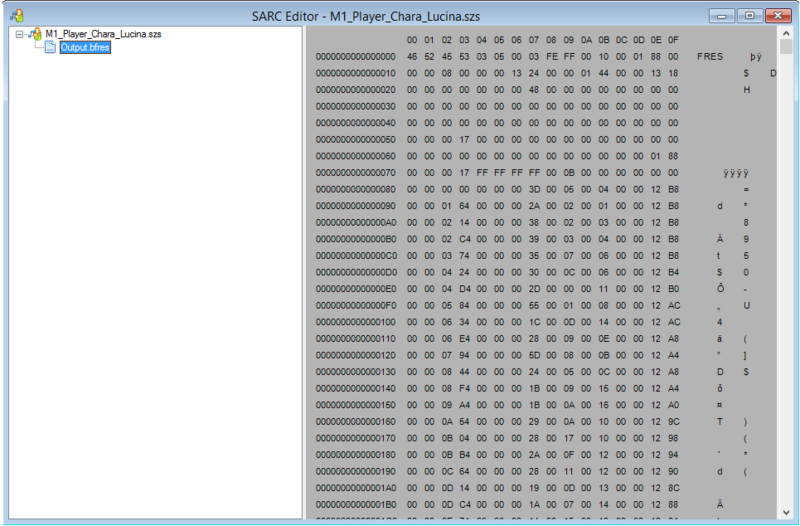 Now, go into the original .szs file and right click on Output.bfres. Choose replace, and then double click the Output.bfres you saved. The HexDecimal to the right should change, and is a good way of determining that it's been imported. Now, just save the .szs file. Congratulations! You just made a Mystery Mushroom costume! Just put it on your SD Card (content/Model) and test it out! I hope this tutorial helped! RealHeroicGamer (http://mariomods.net/profile/131-realheroicgamer) has found a way to change the text for Mystery Mushroom costumes and the menu images. I'm going to explain how to change the text, but we've run into problems when we try to edit the images. For whatever reason, the sprite for the actual mushroom goes invisible, so you have no way of knowing where the mushroom is in-game or where you placed it in the editor. So, unless someone can figure that out, I won't explain that. Other than that, the only thing you'll need it Wexos's Toolbox, which you can find at the top of the tutorial. The files for the costume name and costume game are both found in content/Message/CommonMsg_EUen (for Europe) or content/Message/CommonMsg_USen (for USA). Other languages, such as Spanish and French, can also be found here. 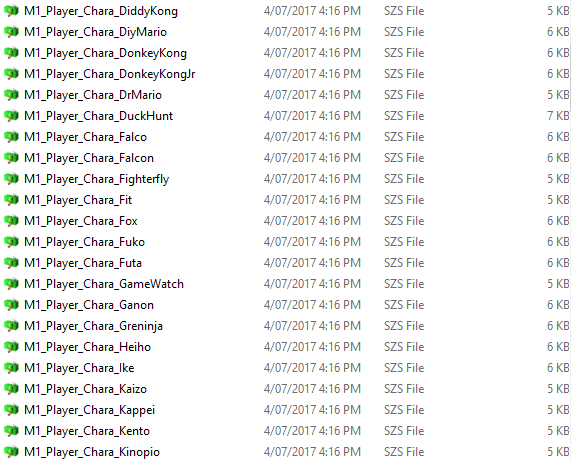 In these files, you'll be able to find Cmn_CharaMario_Title, where the game names are found, and Cmn_CharaMario_Name, where the character names are found. You need to export the files using Wexos's Toolbox, and then open them in MBST Editor. 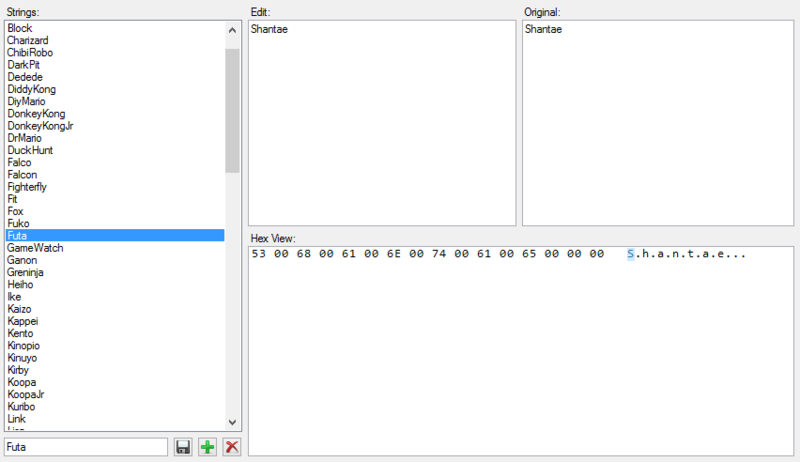 After opening the file in MBST Editor, you're going to need to find the character you want to edit. Similarly to the Model folder, the game uses Japanese names internally. However, the files will show the character's English name if you click on it. In the edit section, just type in the name of the character you're putting in. The HexDecimal at the bottom will change to show your edit. After you've finished, save the MBST. Also do this for the other file if needed. Now, you just need to replace the files using Wexos's Toolbox. This is done in the same way as replacing images for costumes. Now, just put the files on your SD card. Now, the text should be there. Did you make that from scratch? I like it. Kirby-Kid on Deviantart (https://kirby-kid.deviantart.com/) made the sprites, I just imported them into the game. I'm not sure, but I think he used Marth or Lucina as a base, as the faces matched when I imported them. The Street Fighter Ryu joins the roster of Super Mario Maker Mystery Mushroom Costumes! He goes over Dr. Lobe (from Big Brain Training/Costume 98) and is the first costume I've created that doesn't use the sound effects of the character they're over! Ryu uses the sounds of the Goomba costume, the only downside of which is that it plays the sound of a Goomba being stomped on when you press up. The sprites for this were, once again, created by Kirby-Kid on Deviantart (https://kirby-kid.deviantart.com/). I imported it using Wexos's Toolbox and Paint.NET. Kirby-Kid has created sprites for one more skin I plan to import, so the only thing to do there is decide who it'll go over. If anyone knows where the sound effects for the Pokemon and ? Block are, please tell me. If someone tells me where they are, I'll update this to feature those sound effects instead of the Goomba's. Spacehamster joins the lineup of Mystery Mushroom costumes in Super Mario Maker with this mod! He replaces Lottie from Animal Crossing (Costume 84), and, like my Ryu mod, also has a voice mod! Similarly to the Ryu mod, the voice used is the Goomba's. This is the last of my mods based on Kirby-Kid's sprites, so thank you for allowing me to use them. I have found some more sprites for other characters, so I do plan on making more mods of those if I get permission from the creators. I imported the sprites using Wexos's Toolbox and Paint.NET. My username is evrules5. I mainly play on Java, though I sometimes use PE. I don't really play too often, but this might be what it takes to get me back into Minecraft. Wait, is the server only on 1.8.8? Is there a reason for this? Also, the server says Im not whitelisted. The BossNfp files for the costumes you mentioned, as well as many more, dont seem to be in there. However, a pack was made by Memoryman3 that has all the files for them (https://gbatemp.net/threads/super-mario-maker-x-amiibo-now-you-can-access-all-costumes-without-an-internet-connection.467960/) - I use this to replace those characters, and it does work. As for the problem with the images, what file format was the image? Ive had problems with DDS files, but PNGs have always worked for me. And for the sprites going back to the original when you face the left, I have no clue. The only thing I can think of that could be causing this is that the costume has seperate sprites for facing left and right, though I dont think any of them do. If you send me the .szs file in Discord (you can find me in the MMM Discord), I can have a look at it to see what the problem is, if you want. This is a pretty good mod. You might want to move the walk/run sprites down a pixel, since they look like theyre floating. As for the sound effects, l do know a way to fix that. If you copy the sound file (in sound/CharaMario) and rename it to Rosalinas sound file, it will have Peachs sounds. Fred Flinstone joins Super Mario Maker as a Mystery Mushroom costume! He goes over the Trampoline costume, and has the sound effects of the Goomba, this is so that he doesn't make a bump sound when he jumps. The sprites for this mod were made by FillertheFreak (https://www.spriters-resource.com/submitter/Fillerthefreak/) on the Spriter's Resource, and were imported by myself, evrules5. The sprites were imported using both Wexos's Toolbox and Paint.NET. Ah, I saw this one on the Spriters Resource! Nice import! Thanks! I kinda rushed this one, since I wanted to release it alongside Buntendo's Meme Theme, but I'm glad it turned out well. Only downloading because it has the old Bob The Builder and therefore I have respect for you. Thank you for reminding me of the monstrosity that is the new Bob the Builder. Page rendered in 0.237 seconds (with 1.522 MB of RAM).